Inspiring step by one of my clients today. Leading the way to encourage businesses to talk openly about mental health issues with staff at all levels. Will others follow? All great changes started with a small step. This is mental health awareness week so it makes sense to do something fitting. 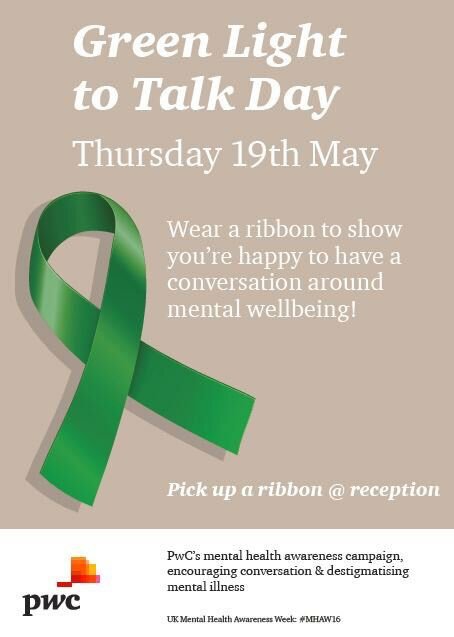 But wouldn’t it be much better if we wore green ribbons all of the time to signify we are comfortable having a conversation on Mental Health? It almost seems we are only giving permission to speak up about mental health on a set date! Which is crazy. We all know someone who is struggling with a mental health issue. Lets start a conversation, and keep talking/listening/signposting. Remember to be mindful of your own wellbeing as well. Take very good care of your mental health. Previous Thoughts on the Orientation week from the Associates…..
Next Diversity or not Diversity – when is it really an issue?